If the Labour Party’s new leader retains their full confidence and support, by Christmas 2014 he could well be our next Prime Minister. 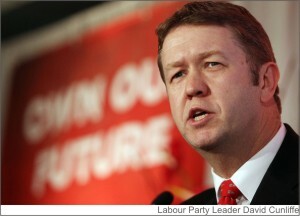 What do we know about David Cunliffe and his ideas? Fortunately, the three-week ‘primary’ used by Labour to select their new leader, has given us an opportunity to better understand the candidates and what they stand for. It would be fair to say, that by the end of the contest, they collectively stood for a great deal, since almost anything that Labour Party members or the unions asked for, at least one of the three contestants – David Cunliffe, Grant Robertson, or Shane Jones – agreed to. According to political commentator David Farrar, between them they made 43 major policy promises – David Cunliffe led with 19, closely followed by Grant Robertson on 18, with Shane Jones a distant third on 6. But before we look at Mr Cunliffe’s policy promises, let’s reflect on some of the broader issues that have surfaced since Labour’s former leader David Shearer resigned on 22 August. First of all, it is now clear that the new leadership selection process adopted by the Labour Party last year could well be a recipe for Caucus division and long-term disunity. Caucus members are likely to be resentful of the fact that a decision as important as the choice of their leader – which they would undoubtedly argue they are better positioned than anyone else to decide – can now be decided against their wishes by party members and the unions. The ensuing tensions within caucus that will develop whenever these factions are out of step are more likely to fester and grow, than go away. Under the new selection rules, adopted at their November conference, the Party Leader is determined by the total votes cast in an electoral college, with 40 percent of the votes coming from the parliamentary caucus, 40 percent from party members, and 20 percent from affiliated unions. This new voting system has ensured that Labour Party leaders will be directly answerable to the union movement. When the leadership votes were finally counted, David Cunliffe had won 51 percent of all votes cast – 32 percent of the Caucus vote, 60 percent of the Members’ vote, and 71 percent of the Union vote. Grant Robertson had won 33 percent of all votes cast – 47 percent from Caucus, 27 percent from Members, and 17 percent from Unions. Shane Jones had won 16 percent of the votes – 21 percent from Caucus, 13 percent from Members, and 12 percent from Unions. While David Cunliffe comprehensively won the Members’ vote and the Union vote, Grant Robertson won the Caucus vote through the support of 16 MPs, compared to 11 for Mr Cunliffe, and 7 for Shane Jones. While the votes were carried out by secret ballot, a number of political commentators have suggested that the Caucus members supporting Grant Robertson are likely to have been Jacinda Ardern, David Clark, Clare Curran, Ruth Dyson, Kris Faafoi, Darien Fenton, Phil Goff, Chris Hipkins, Raymond Huo, Annette King, Andrew Little, Trevor Mallard, Maryan Street, Phil Twyford, and Megan Woods. Those supporting David Cunliffe are likely to have been Carol Beaumont, Lianne Dalziel, Iain Lees-Galloway, Moana Mackey, Nanaia Mahuta, Sue Moroney, Rajen Prasad, Su’a William Sio, Louisa Wall, and Meka Whaitiri. And those supporting Shane Jones are likely to have been Clayton Cosgrove, Damien O’Connor, David Parker, Ross Robertson, David Shearer, and Rino Tirikatene. The divisions between the Caucus factions run deep, and a dislike and distrust of David Cunliffe has been entrenched. Always ambitious for the top job, Mr Cunliffe has long been accused of arrogance and disloyalty. In particular he is said to have undermined Phil Goff after Labour’s 2008 election loss, even though he never challenged him outright. Many believe he is largely responsible for Labour’s disastrous showing in the 2011 election, by failing to provide leader Phil Goff with detailed costings of Labour’s election promises. As the Party’s ‘numbers man’ he is said to have left Mr Goff exposed in a critical leaders’ debate, where the Party was accused of promoting expensive, uncosted policies by Prime Minister John Key, whose “Show me the money” demands were left unanswered. According to the Dominion Post’s Andrea Vance, after the 2011 election, when David Cunliffe decided to stand for the Labour Party leadership, “A concerted smear campaign orchestrated by senior MPs Mr Goff, Annette King, Trevor Mallard and Clayton Cosgrove – known as the ABC (Anyone But Cunliffe) faction – ensured that relatively inexperienced Mt Albert MP David Shearer was elevated to the leadership. Cunliffe’s reputation, as untrustworthy and conniving, stuck in the minds of media commentators and the wider public. Shearer struggled to get to grips with the top job, and within a year murmurs of dissatisfaction began to emerge from the party faithful as the annual conference approached last year.”2 As they say, the rest is history! In looking to the future, the key question for the Labour Party is whether their new leader has the capability to heal the disunity that has plagued them since Helen Clark stepped down in 2008. There were high hopes that Mr Cunliffe would attempt to unite the factions within the caucus by inviting their preferred candidate Grant Robertson to become his Deputy Leader. It is still not clear whether Mr Robertson was invited and declined – preferring instead to leave his options open – or whether he was not invited at all. But whatever went on behind the scenes, what we do know is that the finance spokesman David Parker was the only nomination for Deputy and that he was elected by the caucus unopposed. However, a much-needed bridge has not been built between the factions, and while peace appears to have broken out at present, it certainly does not mean that it will all be plain sailing for HMS Labour. In fact they ran into light air almost straight away. Mr Cunliffe not only failed in his much publicised promise to wipe the floor of Parliament with John Key during his first Question Time as Leader of the Opposition, but he duffed his questions as well – not once, but twice. He is also understood to have been flouting Parliamentary employment laws by challenging Labour Party staff members about who they voted for in the leadership contest, before extending the contracts of some, while giving others their marching orders. And as if David Cunliffe won’t have his hands full from the fallout from the appointment of his Shadow Cabinet – as experienced MPs who opposed him lose their portfolios and are demoted – he has now been exposed by the media for falsifying his parliamentary CV! So how is David Cunliffe planning to win the next election? David Cunliffe knows these big-spending policies are simply unaffordable for New Zealand, but in order to gain sufficient support from Labour Party members and the unions to win the leadership contest, he promised them anyway. As Prime Minister, he will want to deliver on as many of them as he can, even though such campaign promises would undermine the New Zealand economy. Throughout the leadership election campaign, David Cunliffe has consistently misled New Zealanders by understating the cost of his lavish policy promises. But Prime Minister John Key is now challenging him: “Key said Cunliffe would need to check his figures if he wanted to keep in the fight. The prime minister told Breakfast that Cunliffe’s costings for a living wage were out of whack – costing $2.5 billion to $4 billion rather than the $20 million to $30 million Cunliffe said on the campaign trail.”6 The Institute for Economic Research has put the cost of establishing the $18.40 living wage across the country at an unaffordable $3 billion to $4 billion a year. David Cunliffe believes he can win the 2014 election by making promises that will mobilise the 800,000 people who failed to vote in the last election to vote for him. He has also been promoting radical environmentalism in an attempt to win Labour voters back from the Greens. But his lurch to the left means he will have to abandon the undecided middle ground voter who doesn’t want populism nor extremism – just a government capable of competently managing the economy so they can build a better life. Do you think Labour’s new leader will improve Labour’s chances of winning the next general election?